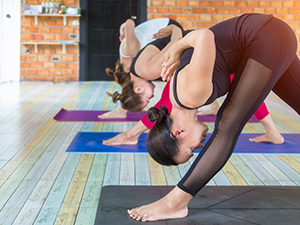 Yoga is becoming an incredibly popular fitness activity, and for good reason — it helps increase flexibility and energy, build strength, improves respiration, prevent injury, and you can finish the class laying on the floor. So, if you haven’t yet attended a yoga class, it’s time to discover the incredible benefits for yourself! Water and Rock Studio offers yoga classes at both of our Burlington and Philadelphia locations that are led by experienced instructors who are passionate about teaching their students about yoga. Or if you want to enjoy a relaxing session at home, you can work with one of our personal trainers in the comfort of your own home with in-home sessions or online video classes. We want to make improving your fitness level as convenient and as fun as possible! So now that you’ve decided to try a yoga class (we know you want to), the question becomes which class should you try first? 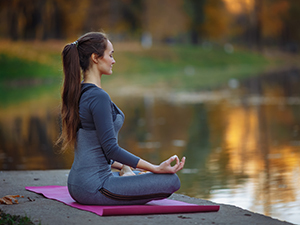 Many people might not realize that there are actually a variety of yoga classes, and depending on what you’re looking for, or what your body or mind needs, you can find a class that fits those needs. In yoga, there are specific poses to stimulate and balance each chakra — the Warrior II pose to activate the belly chakra, for example. We could write a whole series on chakras, but the best way to learn and feel this type of yoga, it’s best to attend a class. To help increase flexibility and to achieve a level of relaxation, restorative yoga is a great choice. These classes consist of only five or six poses that are held for five minutes or more. The poses include twists and folds that stretch the fascia in the body, which are sheets of connective tissue. As you breathe deeper into the poses, the fascia is given a deeper stretch, which helps increase flexibility. Restorative yoga classes are done with various props to ensure that everything is done safely. Meaning “force” in Sanskrit, hatha is actually a category that includes several types of yoga, but when you see the word hatha on a class schedule, you can expect the class to be fairly slow and gentle. Hatha yoga classes will include a focus on the breath and movement in order to bring peace to your mind and body. To add to the confusion, vinyasa is also a broad term that includes several different styles of yoga. When you attend a vinyasa yoga class, you can generally expect the movements to be quicker while synchronizing the breath. Vinyasa flow classes will move from pose to pose in a continuous fashion. At Water and Rock Studio, we offer yoga classes that everyone can enjoy, whether you understand the various terms or not. One of our most popular and fun classes is our goat yoga! These classes are fun, sometimes silly, and include a lot of breathing and stretching. If you’re interested in joining us for our next class, you can sign up for goat yoga here! Join Water and Rock Studio today for a balancing and mindful yoga class.